Uh-oh. I doubt “Bzzrt!” is a good sound, especially when a mindlink tendril is being forcibly disconnected from a FutureTech interface. But I’m just speculating here. 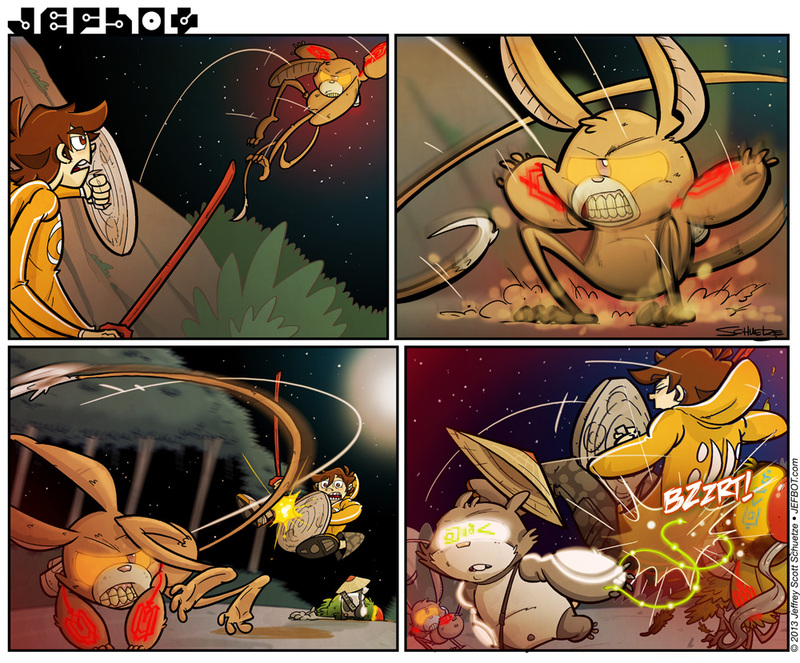 And sorry for the late strip, BOTpeeps! Busy weekend and then busy day today trying to finish the strip while keeping current on all the Playstation 4, XBOX One and Apple news coming out today. GAMERbots! Check out the new poll to vote on your favorite current or upcoming game consoles, here! you might just be right, flame_fingers! let’s hope it’s not too corrupted, if so! your Shades-fu was strong, f_f. true that. wouldn’t want to get bitten by those chompers. i’m not sure bot could handle all the beasties by himself, Insectoid, but if Mu remains mind-scrambled, he may not have a choice. heheh. well, let’s hope that Mu’s brain has better backup/redundancy/reboot capabilities than most modern computers, TCG! I thought Tail Whip lowers defense, not flinging you 20 feet away! Just curious, what’d you think of After Earth? I hear it was just set up to launch Jaden’s career. this Tail Whip is definitely more of a melee attack, ROM! as for After Earth, i didn’t think it was as bad as the 11% RT score made it out to be, but still, i wouldn’t recommend plunking a lot of money or time on it. would be a decent afternoon Netflix watch. but what was he supposed to do? Wait for device to be able to be safely removed? *Scared* Mutapets don’t run on Windows, do they? and let’s hope that if they run on Windows, it’s not Windows ME or Vista, Maryz! Here’s hoping Mu can fight on muscle memory alone . . .
Or maybe ‘bot can find a way to reboot him and maybe short out the bad guys? let’s hope so, Sarah W! methinks there are gonna be many more challenges that bot might not be able to handle by himself. Uh oh. I can’t wait to see the outcome of this FutureTech interface interruption. I don’t know if that was an accidental or intentional slip mentioning them, but it confirms something I’ve been thinking since shortly after this story arc picked back up. What’s *really* going on with these abducted pets? Only time (and you) will tell! On another note, did anyone here watch the gameplay reveal of Destiny last night? I did, and it was freaking awesome!!!!!! agreed: Destiny looked amazing, JGT! so far, i haven’t seen any absolutely killer apps for the next gen consoles but Destiny and Titanfall came close. Uh oh… Let’s hope bot can fix this by reattaching the tendrils without causing any harm to either Mu or himself. Im’ma gonna buy both of them… Why? Cause I’m a geek, I love all things video games. Though right now I’m just waiting patiently for deadpool the game. Been enjoying this story line a lot just waiting for them to find the person they are searching for. Also how are things going for you sir jefbot? i’m sure i’ll eventually get both, Satoshieyes, but now that money’s a bit tighter than when i had a regular office job, i’ll have to pick and choose more carefully. after the conferences, i’m leaning toward the PS4 but we still have a while before these things launch so i wouldn’t be surprised if Microsoft makes a stronger case for the XBOX One before then. Oh dear, that’s about five kinds of not good. Let’s just hope that disconnecting mid-hack doesn’t have many serious side effects for Mu and possibly the parrot. disconnecting mid-hack can’t be good, Fijiman, but yes, let’s hope the side effects are manageable, for bot’s (and Mu’s) sake! Did this mouse have alligator DNA inserted into it by any chance? Anyway, a lot of inexperienced people get injured by alligators and crocodiles because when they approach them (possibly to remove them from golf courses and yards) they worry about their jaws but fail to account for their powerful tails. good to know, Rainey! next time i encounter a croc (or mutant mouse) i’ll be sure and keep an eye out for that tail! let’s hope the data’s just corrupted on the Mouse-thing’s end, dj, and not Musashi’s! not yet. unplugging it for 10 seconds then plugging it back in again works too, right? I doubt Mu will be permanently damaged… can”t say the same for the bird though. Something tells me that when brains are involved “Eject USB Safely” takes on a whole new meaning. so true, blackjacket42: one must always remember to close one’s systems out properly before disconnecting! That isn’t good at all.